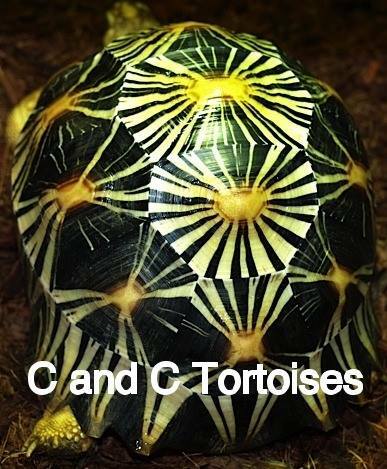 Spider Tortoises earn their common and Latin names from the web-like yellow patterns marking the back of its shell. 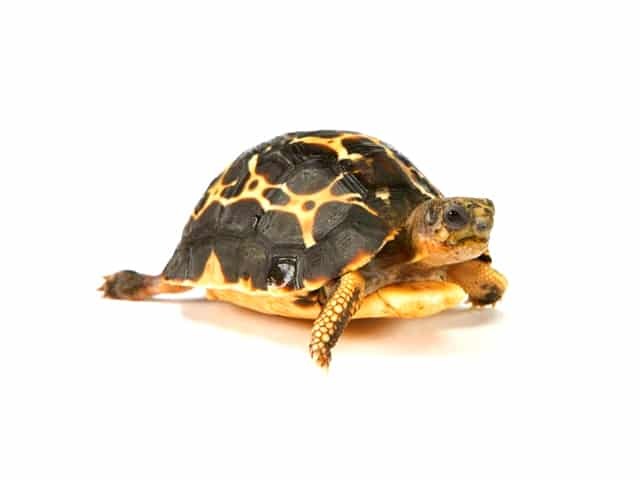 They are one of the smallest known tortoise and a critically endangered species. The shell is a cream color, and the black pattern extends outward in all directions from the areola of each vertebral and pleural scute. The arachnoides subspecies has a plastron totally devoid of markings and the anterior lobe will close completely to touch carapace. The oblonga subspecies has a plastron with black markings on scutes and the anterior lobe will close completely to touch carapace. The brygooi subspecies has a plastron totally devoid of markings but the anterior lobe will not close fully to touch carapace. I keep my pair of spider tortoises in a custom built melamine enclosure measuring 0.9 meters long by 0.6 meters wide by 0.3 meters high (3 x 2 x 1 feet). I recommend using Rubbermaid bins for babies and juveniles. A bin the size of a shoe box would be good for a year or more. A smaller bin is better than a larger bin at first because the tortoise will feel more secure in it. Spider tortoises are not a very active species most of the year so this provides ample room for these small tortoises. I provide the tortoises with a small Rubbermaid as a hide box. The box is approximately 12 inches long by 6 inches wide by 6 inches high. The tortoises use this regularly to sleep in. I’ve tried a few different types of substrate but I find the best is either coco coir or cypress mulch. Both hold humidity well and are mold resistant. I provide a layer about 0.07 meters (0.2 feet) deep so they can burrow into it if they desire. I leave the lights on for 12 hours a day with the exception of winter. During the dry period, I only have the lights on for 10 hours a day. I use mercury vapor bulbs for lighting and heating. They emit heat and UVB which is essential for proper bone and shell development. I place the light at one end of the enclosure and the temperature is about 43 ºC (110 ºF) directly under it. The other end of the enclosure is usually about 26-29 ºC (80-85 ºF). Water is very important for all species of tortoise and should be provided at all times. I use a small dish that is 0.15 meters (0.5 feet) in diameter and 0.02 meters (0.06 feet) deep. I also soak the tortoises a couple times a week in shallow warm water. They usually urinate and defecate at this time which helps keep their enclosure from getting dirty. I try to keep humidity fairly high by misting the enclosure daily. I do this every season with the exception of winter. During the winter the substrate is allowed to dry out. This mimics the dry season they would naturally have. At this time they become inactive. Once spring arrives and I begin misting again they start becoming more active again. Spider tortoises will eat a variety of greens including dandelion, kale, collards, endives, grasses, clover and hibiscus leaves and flowers. They also enjoy squash, pumpkin, yams, mushrooms, papaya, cantaloupe and strawberries. I also sprinkle calcium with vitamin D3 on their food twice a week. I feed daily and I chop up their food so it is easier for them to eat. Leafy greens are mixed and the vegetables are cut into small cubes about any inch squared. I would recommend shredding vegetables with a cheese grater for babies. This is a shyer species that will often hide in their shell if picked up. I try to limit handling as much as possible to reduce stressing them. Spider tortoises are one of the smallest species and don’t make much of a mess. Soaking them a few times a week also helps to keep their enclosure clean. I spot clean areas of the enclosure daily to remove any substrate that has been soiled but complete substrate changes are only done about 2 or 3 times a year. These tortoises can suffer from most common reptile health problems, but in general they are hardy tortoises. The only health problem I have encountered was during egg laying. The egg was too large for the female to pass so my vet had to break the egg in order for her to pass it.